Shocked by the price of new furniture, we dug deep to find out why – and discovered how you can halve your bill by buying smarter. The answer may surprise you. We found that when you buy new furniture a large proportion of the price you pay goes to margins. Consider the metals in a chair, desk or storage unit: a mining company digs up the iron or aluminium ores (and takes a margin), these are refined (margin), shaped, finished, assembled, and distributed (four more margins). 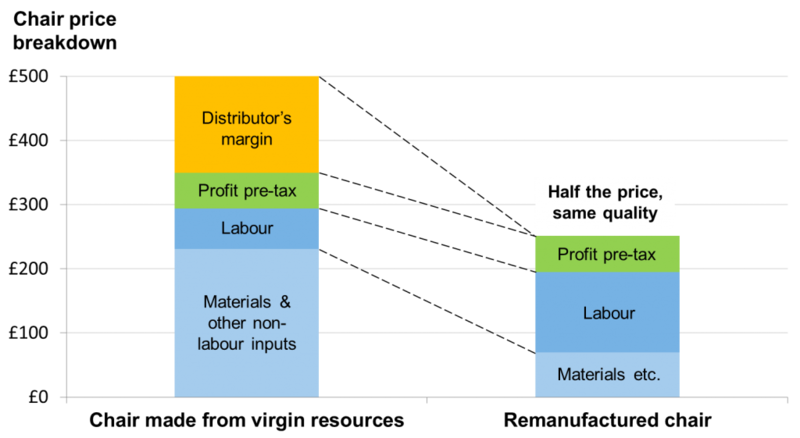 Even if you can negotiate a discount with the distributor, the other margins in the supply chain remain. We examined how these costs are reduced when the long-lasting elements in office furniture (such as the metal structural components and mechanisms) are removed from good quality used pieces and reassembled with other new components in a process called ‘remanufacturing’. Distributor’s margin: £0, because you can buy direct from a remanufacturer. For the purposes of this calculation we have assumed that the distributor’s margin is 30% of the sale price. This is an immediate saving of £150. Cost to source used furniture with long-lasting components in good condition and additional new components: £69 (just 30% of the cost of the original materials costs). Labour cost to strip back and reassemble: £125 (twice the new-build 18%, because there is both disassembly as well as assembly, doubling the original labour requirement). Remanufacturer’s profit margin: £56 (same as new). The resulting cost for a remanufactured chair is £250 – half of what you now pay. We were surprised too. We double-checked the numbers and remanufactured some furniture to see if theory translated into reality – and it did. Along the way we discovered that the long-life components of furniture also have the greatest environmental impacts – so remanufactured furniture is also less environmentally expensive. And because there is twice as much labour, job numbers are doubled. This means that remanufacturing creates cost savings, environmental and social benefits. For more details see what is the most sustainable office furniture. Remanufacturing is a growing alternative to expensive new equipment. Most photocopiers, such as those made by Kyocera, Ricoh, Fuji and Xerox, are remanufactured – so you probably already have remanufactured items in your office. The UK’s Department of Defence rely on Caterpillar’s remanufactured engines to drive their vehicles. So the reliability and quality of remanufacturing is proven. Companies like the Royal Bank of Scotland and leading universities are already sourcing remanufactured office furniture and embracing the savings and enhanced environmental credentials that it provides. The photos in Figure 2 show the high quality achieved through remanufacturing. The quality is so good that each piece comes with a warranty. You don’t have to wait for your next office move to buy everything remanufactured. Remanufactured furniture is perfect for additional furniture when you grow your office – because you can match the exact make and model, as well as colours and finishes of your existing furniture (because seats are recovered, bases are recoated and desks have new tops made). That way you can see the quality for yourself with a small initial order. Big savings, sustainability benefits, no risk – just what every modern procurement professional is looking for. More tips and advice to create a great office are available at the Rype Office Blog, dedicated to creating beautiful, budget-friendly, productive and sustainable offices. Greg Lavery is the founder of Rype Office, which remanufactures office furniture to a high quality. Rype Office has a design team to help clients create a beautiful, productive offices at half the recommended retail price of new, using remanufactured and sustainable office furniture.